(Nanowerk News) Researchers at Washington State University have discovered a new type of cooperative photosynthesis that could be used in engineering microbial communities for waste treatment and bioenergy production. 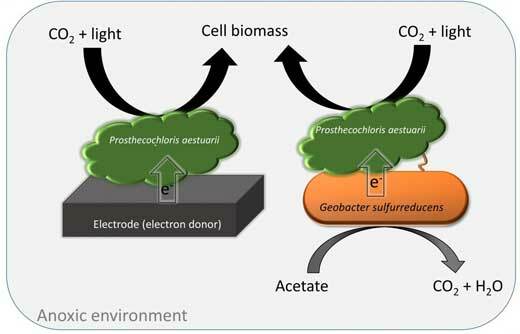 They report today on the unique metabolic process seen for the first time in a pair of bacteria in Nature Communications ("Syntrophic anaerobic photosynthesis via direct interspecies electron transfer"). Photosynthetic bacteria account for nearly half of the world's food production and carbon-based organic material. The research could also improve understanding of lake ecology. Prosthecochloris aestaurii , a green-tinged, plant-like microbe, comes from the extreme environment of Hot Lake, a high salinity lake in northern Okanogan County near Oroville, Wash. Discovered and identified a few years ago by researchers at the U.S. Department of Energy's Pacific Northwest National Laboratory and Southern Illinois University, the bacterium is able to photosynthesize, using sunlight along with elemental sulfur or hydrogen sulfide to grow. Led by Haluk Beyenal, the Paul Hohenschuh Distinguished Professor in the WSU Gene and Linda Voiland School of Chemical Engineering and Bioengineering, and postdoctoral researcher Phuc Ha, the research team surmised that the bacteria might be able to help each other grow and put them together in the lab. "We think this could be a common bio-electrochemical process in nature," said Beyenal, whose team is working to better understand the electron transfer mechanism.